Our Facebook page provides a forum for Veterans, Servicemembers, and their spouses and children to learn how the GI Bill works. 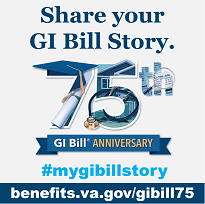 If you would like to learn more about the GI Bill or if you have specific questions about your benefits, please visit the official source of information about the GI Bill at www.benefits.va.gov/gibill. VA aims to create an open discussion related to the content on this page and encourages helpful and useful comments. We will post and attempt to comment on legitimate questions and concerns regarding the protection, use, storage, or dissemination of personally identifiable information (PII) or individually identifiable health information (IIHI). Please note that this is a moderated page, meaning that all comments will be reviewed for appropriate content. Please show respect to those who will read your comments. Comments that do not directly relate to the GI Bill, including abusive or vulgar language, spam, hate speech, personal attacks, or similar content will be considered “off topic” and may not be posted on this channel. We reserve the right to determine which comments are acceptable for this page. We will however, post and attempt to comment on legitimate questions and concerns regarding VA's mission and the Department's efforts to provide Veteran benefits, health care, and burial and memorial services. Be aware that the comments published on all parts of this page—even when the commenter identifies himself or herself as a VA employee—are not to be considered official communications from the Department of Veterans Affairs. The responses, by nature, have to be general. The programs discussed are complicated and most rules will have exceptions and caveats. If you have a specific question about your specific situation, please visit our secure question and answer site. Although VA will not collect or retain these comments in our records, this is a public forum and any information provided in comments may be publicly available on www.benefits.va.gov/gibill and the privacy policies of www.benefits.va.gov/gibill apply. Please remember that this is a public forum and any information provided in comments will be available to the general public. As such, please do not include personal details such as a veteran file number, social security number, or any other information you do not want to be available to the general public. If you choose to post personal information, you do so at your own risk. VA disclaims any liability for any loss or damage resulting from any comments posted on this page. This forum may not be used for the submission of any claim, demand, informal or formal complaint, or any other form of legal and/or administrative notice or process, or for the exhaustion of any legal and/or administrative remedy. If you have specific questions regarding a VA program that involves details you do not wish to share publicly please contact the program point of contact listed at www.benefits.va.gov/gibill.